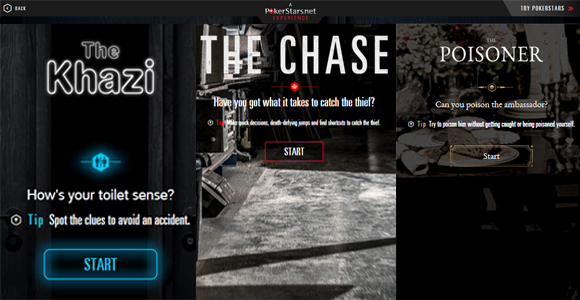 It seems PokerStars.net has been busy building an interactive site, where poker players can go and test to see what kind of natural born skills they have. They use different scenarios, or games, in order to determine how a player would react in each situation, and in the end, we get an easy analysis on personality. The Poisoner: which tests your skills in Detection, Bluffing, and Bravery. The Chase: which tests your skills in Cool Head, Bravery, Quick Thinking. The Khazi: which tests your skills in Detection, Logic, Quick Thinking. There are many other games that will be added as they are finished, which will test players in different areas important when playing poker. All you need to do is play at least 3 games in order to process what type of player you are, and see where your strengths are. Once you figure out whether you are brave or have a cool head, you can read all about how to use that to your advantage while you play. See whether or not you are a natrual born poker player, and see what skills you have at your disposal by playing at their website.